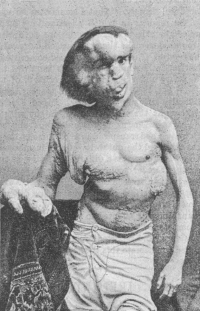 Joseph Merrick in the 1889 British Medical Journal. The gift of cinema is a holistic experience like no other art form. It engages every sense but smell and taste (unless you count when John Waters’ “Polyester” was being screened. Scratch and sniff cards were handed out at the theaters, like 3-D glasses, and not all of the scents were as pleasant as the classroom childhood relics flavored with bubble gum and chocolate mint). Regardless, cinema even moves beyond engagement of multiple senses, suspending our belief and dissolving the barriers between story and self. The critically acclaimed Russian filmmaker Andrei Tarkovsky (1987) proclaimed “the literary work can only be received through symbols, through concepts—for that is what words are; but cinema, like music, allows for an utterly direct, emotional, sensuous perception of the work” (p. 176). Merleau-Ponty (1964) observed that a movie is not thought; it is perceived” (p. 58). Indeed, there is something about an experience with film that moves us beyond observation to a subjective state of being. Along the same lines, Merleau-Ponty also stated that “the movies are peculiarly suited to make manifest the union of mind and body, mind and world, and the expression of one in the other” (p. 58). Certainly, our precarious identification with new characters and life contexts is buffered by the medium cinema provides. Often times, we aren’t even conscious of our identifications with characters, and yet on a deeper level, there is a sentiment for the familiarity of strangers. Our sense of self expands primarily because we feel more, not so much because of what we think about our observations. The film holds up a visceral mirror. In light of this, my review of “The Elephant Man,” directed by David Lynch, is entirely relevant to the personal gift that cinema brings. The film is an adaptation of the 1977 play by Bernard Pomerance, and is based on the true story of John Merrick, a man born severely disfigured due to a trauma his mother suffered during her pregnancy, and Dr. Frederick Treves, a man who “buys time” with the Elephant Man from the Circus Freak pimp, Bytes. Over the course of their relationship, both the disfigured man and the highly revered doctor are transformed by not only their exchanges and developing fondness for one another, but also by the situations that are anomalous to their former everyday existence. Enter once horrified nurses who are now friends, socialites who exploit under the pretenses of charity, bar-rats who take advantage of young women with the induction of terror upon the sight of the Elephant Man, and the beautiful star of the stage, Ms. Kendall. All the while, more public exchanges take place; in fact, the film begins with commerce. Dr. Treves and other patrons offer their gold coin as if to Charon when crossing the River Styx. The film is trademark David Lynch with its industrialized setting filled with mechanistic grinding and chiming, smokestacks, underground fire, and dark alleys. These dark places set the stage for a hermetic quality of this journey to the underworld. Hermes was one of the few Greek gods who could travel to Hades. He was also the god of Commerce. Off the screen, good money is paid to see the taboo. We have our red light and green light districts in which overindulgence of the other-worldly (which often is not really other-worldly, just cast out) thrives. We are willing to pay to get a glimpse or even a touch of the parts of ourselves most hidden. Bytes and Dr. Treves both take on a mercurial quality, the former through commerce, and the latter through medicine. Regardless, this is how the story exposes the collective shadow. We have personal characters, but we also have a culture that operates under the auspices of “us” and “them.” What we often find is that the “us” we place on a pedestal is often no better than the “them” we shun. “The Elephant Man” brilliantly calls the collective character into question. The personalities and storyline in this film are archetypal. There is a marked similarity to the story of Hephaestus, the Greek god of Fire and the Blacksmith. In short, Hephaestus was conceived out of Hera’s parthogenesis: a result of her revenge on Zeus for cheating on her and conceiving Athena. Hephaestus was born deformed and crippled, and thus Zeus and Hera threw him off of Mt. Olympus to die. The sea goddess Thetis and her nymphs nursed Hephaestus back to health, and he became a gifted blacksmith who showered his rescuer with gifts. Upon this discovery, Hera once again became envious and invited Hephaestus back to Mt. Olympus where he was given his own workshop, as well as the hand of Aphrodite in marriage. Here, we see the union of opposites that has resulted from a recognition of the beauty that exists in the ugly. We see a movement from archetype to integration: duality to the paradox of unity/plurality. Just like John Merrick, Hephaestus is given a home. Although “The Elephant Man” has been criticized for being more emotionally evocative than a “typical” David Lynch film, it seems that the evocation of emotion is precisely the vehicle needed to holistically engage a viewer. It has become “unhip” or “sappy” to feel, and that cool observation and divorced insight is relegated as good art. I disagree. This is just another representation of an encouraged split. In “The Elephant Man,” we see that the depth of emotion is what leads to insight. The story joins our deeper sense of feeling with our higher sense of ethics. Good and bad are not so easily delineated because they do not exist separately. As my 13-year-old son, Joseph, said recently in our conversation about “Tekkonkinkreet,” the similarly themed animé film directed by Michael Arias, “I think the film means that you can be dark and corrupted, and still love somebody.” This statement also applies to “The Elephant Man.” The doctor can exploit, and the deformed body can aspire to spiritual altruism. Both become conscious of this through their exchange, and they develop a deep brotherly love in the process. Merleau-Ponty, M. (1964). Sense and non-sense. Evanston, IL: Northwestern University Press. Pomerance, B. (1979). The elephant man. New York: Grove Press. Sanger, J. (Producer), & Lynch, D. (Director). (1980). The elephant man [Motion Picture]. United States: Paramount Pictures. Tanaka, E., Kamagata, E., Teshima, M., & Ueda, A. (Producers), & Arias, M. (Director). (2006). Tekkonkinkreet [Motion picture]. Japan: Aniplex. Tarkovsky, A. (1987). Sculpting in time. New York: Alfred A. Knopf, Inc.